Heat up a kadai/Non-stick pan in medium heat, pour oil. Add curry leaves, ginger and saute for few seconds. Add Onion, salt and saute well till onion turns light brown color and becomes soft. This will take some time, keep the flame in medium heat and keep stirring in between. Add turmeric powder, chilly powder, coriander powder and garam masala and stir well to mix everything. Add few chopped coriander leaves and stir again. Let it cook again with masalas for say 3-4 mins. Switch off the flame and move to a serving dish. Garnish with few more chopped coriander leaves curry leaves. Serve warm with Chappathi/Dosa/Appam..
2. You can add one finely sliced tomato as well and saute till it becomes soft if you need to add bit sourness to the onion roast. wow...perfect side dish with one veggie,Looks tempting! 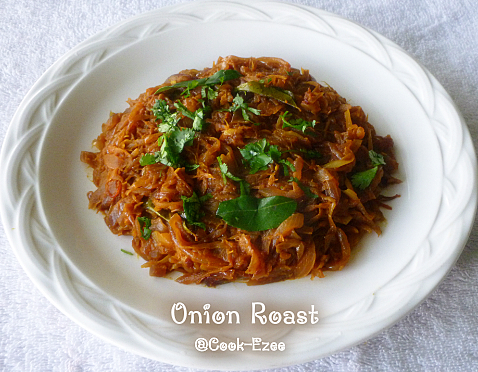 !I usually add in the tomato too..will try this way as well..
simple and delicious onion roast..great with rice or roti.. Simple and easy to make fry looks delicious.My grand mother makes this one for curd rice. very good recipe. thanks for sharing. u r in invited to participate in my blog's first event.do read the terms and participate for sure.